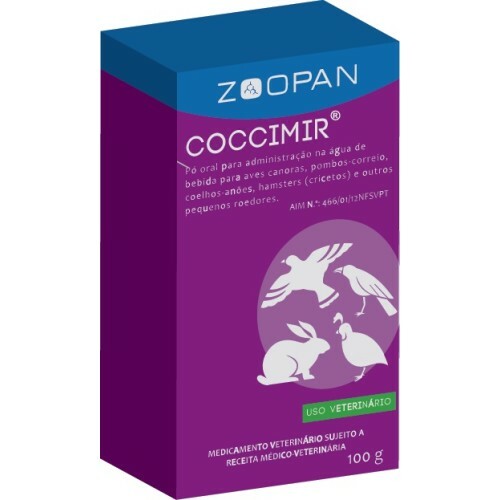 Coccimir 100gr by Zoopan is product very efective for treatment and preventive of coccidiosis, the association of sulphaquinoxaline/ pyrimethamine potentiates the action of both drugs. Vitamin K3 presents an anti-haemorrhagic action. Coccimir is indicated for the treatment of intestinal coccidiosis and for other intestinal infections susceptible to the active substances. - Treatment: 3 g of product per liter of drinking water for 3-5 days. - Preventive: 2 g of product per liter of drinking water for 3 days. Pigeons Products International is an online store with the highest range of products for racing pigeons, pigeons sports, race, pouter, class, etc. dedicated solely and exclusively to the pigeons. Here you can find everything you need for our birds, such as creating a good medicine cabinet and essential accessories with international products.